Butler Plumbing specializes in commercial water heater repair. We proudly serve Edmonton, St. Albert, Sherwood Park, and the surrounding areas. With over 30 years of experience, we have seen it all. Out experienced commercial water heater experts are well trained and familiar with the unique demands of commercial hot water heaters. Not having access to hot water in your business can quickly halt operations and cost a lot of money. Butler Plumbing is your number one choice for fair and reliable commercial water heater repair. We will get the job done quickly and efficiently, so you can get on with your day. Sometimes, emergency strikes. Whether your commercial water heater is leaking or it has just stopped working, the experienced technicians at Butler Plumbing are here for you. We know that a commercial water heater emergency can put your business on hold and that emergencies never strike at a convenient time. That is why we provide 24-hour emergency water heater repair to all of our existing customers. Our technicians are skilled commercial hot water heater maintenance professionals who will trouble shoot your water tank problems and walk you through the process. We also do common water tank repairs such as thermocouples, dip tubes, drain valves, T&P valves, and unitrol or gas valves. We also replace and install hot water recirculation pumps. Not all hot water heaters can be replaced. Our technicians can suggest the best options for replacing your hot water heater. Whether you have a gas, electric, or commercial tankless water heater, we can make sure you have the ideal model for your businesses’ needs. Replacing your hot water heater can save you money in the long run. During the installation process, we carefully handle and install your new hot water heater and remove and dispose of your old tank. 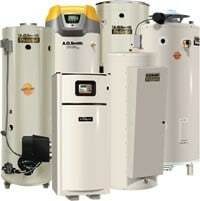 Your new hot water heater will afford you years of trouble free hot water with a new energy efficient tank. Butler Plumbing guarantees all of our work, so you can rest assured that you job is in the right hands. Our high quality service stems from our commitment to each and every customer combined with our wealth of experience in heating industry. We are your trusted source for commercial water heater repair. We ensure that all of our technicians are up to date on the latest technologies, so they can give you the best possible service.